What could be more fun than a kickoff to the final season of our beloved series Game of Thrones? Why, a kickoff right here in the Vale Valle with Over Yonder’s Feast of Thrones. We think it will be worth the travel time across The Westerlands and The Riverlands to the Valle of the Cross. Cersei the Mountain Dawg, Queen of the Mountains and the HooMen will be there on a leash signing pawtographs early on. And the long night is coming and you need to feast! We promise no Frey pie. Everyone across the entire Seven Kingdoms and beyond the realm is invited to the feast. But know this! You must depart before the Game of Thrones makes its anticipated premiere. We wouldn’t want you to be trapped beyond the wall. Aka…they’re not airing the show there. This entry was posted in foodie b'eat, You Should Eat Here! and tagged chef, Events, food, foodie, Game of Thrones, High Country, mead, mountains, Over Yonder, Tasting on April 7, 2019 by triadfoodies. Long time no chat. Been busy traveling and eating while we travel. Stay tuned for some recaps which are way overdue and deserved. I got a note today that triadfoodies was just named a top NC-based blog to follow by FlipKey by tripadvisor. Pretty cool since when we travel across NC and beyond, we love to let you know about the greatest local eats. I’m in some great company in this list. Check it out! This entry was posted in foodie b'eat, press and tagged bloggers, Charlotte, mountains, nc, news, North Carolina, Outer Banks, travel on July 20, 2015 by triadfoodies. We recently took a family trip to the mountains to go skiing/snow boarding. I’m not much of a skiier, more of a faller, but I wasn’t about to waste an opportunity to cross the bridge to H’Appyness and spend the afternoon in my beloved Blue Ridge Mountains with my beloveds. After an afternoon at Sugar Mountain Ski Resort where I fell ONLY ONCE (queue applause, thank you! ), I suggested to mr. foodie a warm and cozy dinner at Over Yonder in historic Valle Crucis (3608 NC Hwy 194). It really didn’t take much persuasion. We’ve been there before and blogged about it, but at the time the restaurant was known as 1816 Farmhouse and just about everything about the restaurant has changed, new ownership, now under Mast Farm Inn and a new menu. The only thing that hasn’t changed is the gorgeous ambiance of the old restored farmhouse in which they are all nestled. They allowed us to choose our table next to the fireplace in the BAR and even turned the fireplace on for us. The first thing about the menu we noticed is that it is more casual with prices to reflect it. By the way, we were wearing ski clothes and though I’m sure you could go dressy to Over Yonder, they certainly made us feel welcome in our most laid-back attire and hat hair. Menu items range from Pork Skins to Grit Skillets, salads and sandwiches to a selection of entrees all under $17. The NC Trout special was the highest price item on the menu and it was still under $20. Really great prices with the average about $12. We were starving, obviously, after several hours of skiing, so we ordered the Pork Belly special appetizer with sorghum glaze, red onion slaw and some candied almonds. I actually missed the description as I wasn’t at the table at the time, but I trusted mr. foodie. The pork belly skin was crispy and the meat was silky and decadent and everything it should be. There was the smokiness to the meat and the sweetness of the sorghum that combined so wonderfully with crisp veggies and it lent a slightly Asian flavor while keeping its southern essence. And was it ever pretty. For my entree, I went with their custom grit skillet. There are a number of options to choose from and I chose Over Yonder’s House-made Ginger & Sage Sausage with Caramelized Onions, Peppers & Provolone, piled onto some hot and perfectly cooked Adluh grits. Just the thing after being on the slopes. mr. foodie ordered the Griddled Pork & Beef Meatloaf with Cheerwine BBQ Sauce with Cheesy Grits and Butterbeans. It doesn’t get much “over yonder” than that. The meatloaf was so tender and really just melted in you mouth. No knife required. The boy kidlet was with us and he ordered Kid’s Grilled Cheese. It was really good and cheddar-y on my fave, Texas Toast. He also ordered the applesauce as a side. It was a chunky applesauce and he wasn’t a fan because he’s just like that, but it was delicious applesauce. He likes apples and we tried to explain, but he is who he is. And though I tried not to do it, I just had to get the Banana Pudding. 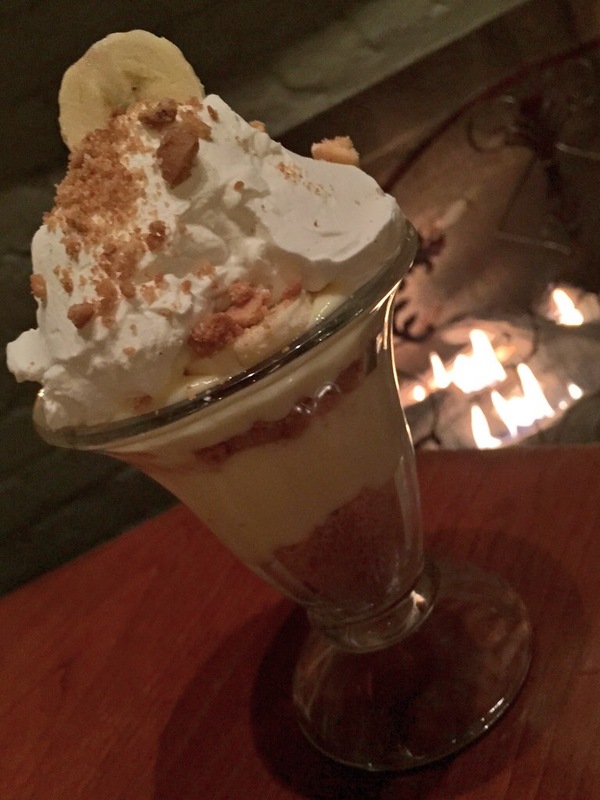 The BEST banana pudding I’ve ever had was right there at 1816 Farmhouse so I was curious if this version would live up to my memory. It was every bit as good with a fresh whipped cream and a beautiful wafer toffee crumb rather than the traditional vanilla wafers. They stayed crispy in the pudding, which totally worked with these particular wafers. And was it ever pretty. mr. enjoyed a lovely Apple Cobbler with Buttermilk Ice Cream. Also delicious. 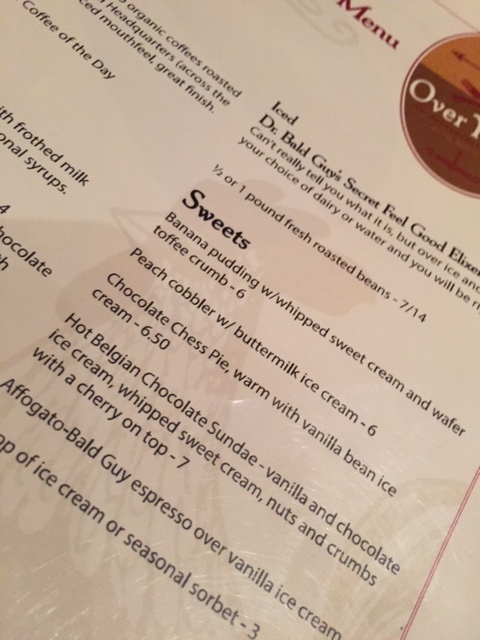 You can pretty much count on a cobbler on the dessert menu at Over Yonder. The microfoodie got ice cream, of course. There were so many items on the menu I wanted to try…it wasn’t an overwhelming menu at all, just that everything looked really, really good with lots of local ingredients. And Over Yonder is open for lunch and Sunday brunch so if you are traveling they are definitely a place to check out. Be sure to make note of their hours below as it changes when it warms up. Of course, the Mast Farm Inn, their Mama Bear, is another place on my bucket list. What’s your favorite place to stay at and eat in our gorgeous NC Mountains? This entry was posted in Beyond the Triad, Restaurants, You Should Eat Here! and tagged $$, Blue Ridge, boone, chef, Date Night, family friendly, Farm to Fork, foodie, Fun with friends, High Country, local, Mast Farm Inn, mountains, skiing, Valle Crucis on January 26, 2015 by triadfoodies.